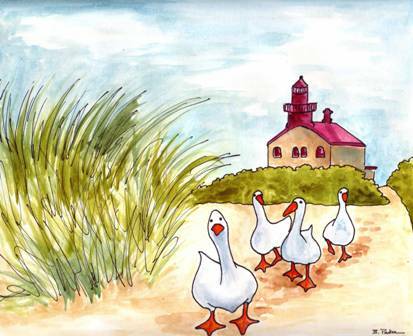 Beth Parker Art: Here Come the Geese! “Our inner dialogue can have awesome power. It often determines the behavior that defines who we are. We do, of course, have some choice as to the direction this inner dialogue will take. It’s as easy to affirm our self-worth with positive messages as it is to tear ourselves down with negative ones. And yet, many of us fall so easily into negative patterns of thought. I have always liked this one. It’s so simple, yet the geese have personalities. The last 2.5 weeks have been testing my ability to remain calm under stress. I did it, but it was a challenge at times. Now to play catch up. Six working days until the 4th of July. I am always the busiest right before holidays, so let the fun begin! More about Napoleon Hill here. Karen Casey, Ph.D., a Naples, FL resident since 1991, published Each Day a New Beginning, her first book, in 1982. This daily meditation book for women in recovery has sold more than 3 million copies. The 25-year Anniversary edition of Each Day a New Beginning was released in August, 2006. It was closely followed by The Promise of a New Day, in 1983, another daily meditation book for both men and women in search of serenity. It has sold more than 1.2 million copies. Following on the heels of these two books, Karen has written 22 additional books with more on the way. In fall, 2005 she published CHANGE YOUR MIND AND YOUR LIFE WILL FOLLOW. In April of 2006 she published ALL WE HAVE IS ALL WE NEED and she published three more books in 2007. SERENITY was released in March. BE WHO YOU WANT TO BE, in April and in December, a companion book to CHANGE YOUR MIND AND YOUR LIFE WILL FOLLOW, called ITS UP TO YOU: A PRACTICE TO CHANGE YOUR LIFE BY CHANGING YOUR MIND. In late July, 2010, LET GO NOW: EMBRACING DETACHMENT was released. Currently Karen is working on her memoir. More here.